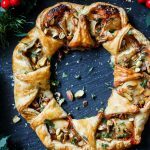 Golden puff pastry wreath filled with sweet cranberry sauce, oozy Brie cheese and pistachios is a fantastic addition to your holiday cheese board. 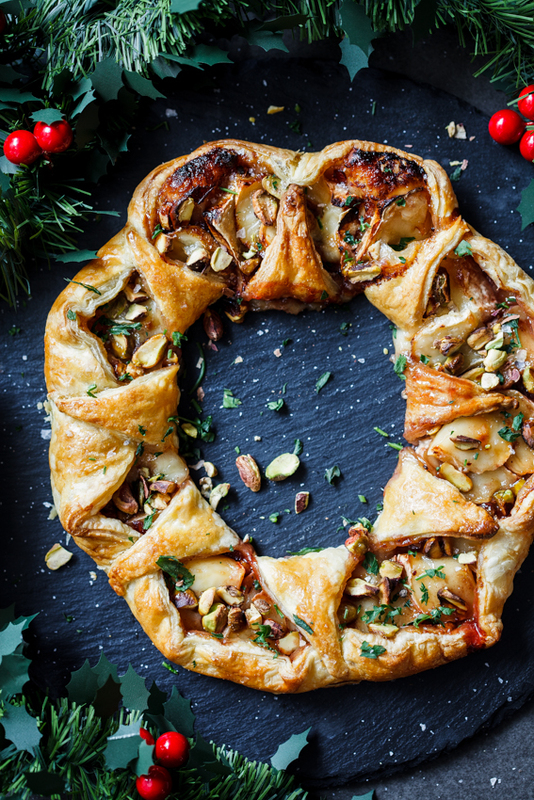 We’re continuing the festive cheer today with this GORGEOUS cranberry and brie puff pastry wreath. Listen, if there’s one recipe to make during the holidays, it’s this one. There’s a reason this video has been viewed more than 3 million times on Facebook! The buttery, golden puff pastry with the sweet cranberries, melty brie cheese and crunchy pistachios is just such a lovely addition to your cheeseboard and will make an awesome appetizer or starter. And isn’t it just the prettiest thing you’ve ever seen? I love this technique of making a wreath and you can bet your bottom dollar, you’ll be seeing a lot more of this on Simply Delicious in the future. But for now I’m going to leave you to go gather all these ingredients and get baking because honestly, once you taste this puff pastry recipe, you’ll want to make it again and again! Start by cutting thawed puff pastry into a large disc. Cut a star into the center and arrange your filling around the star. Pull each point of the star over the filling towards the outer edge and pinch the pastry together with your fingers. Brush with egg wash then bake until golden brown and puffed. Pre-heat the oven to 200ºC/400ºF and line a baking sheet with parchment paper. Roll the pastry out to around 5mm thick and cut a large circle out of the pastry. Lay the pastry on the prepared baking sheet. Spread the cranberry sauce around the center "star" then top with the Brie and pistachios. Bring one point of the center star over the filling as well as bringing the outer edge of pastry inwards. Press the two together and continue until you have a wreath. Brush with beaten egg then place in the oven and allow to bake for 15 minutes until golden brown and cooked through. Remove from the oven, allow to rest for 5 minutes then slice and serve. Make sure that your oven is hot and that the bottom element is in use. You can also place the oven rack lower down so that the heat is closer to the bottom of the pastry. Also, using a runny cranberry sauce could cause a soggy bottom. Can this be made and cooled and eaten? Or does it need to be served warm? It’s better warm as the cheese is still gooey and the pastry will still be crisp it you can definitely serve it at room temp. A beautiful hit at my holiday party. Many compliments and recipe requests. That is so wonderful to hear! I can’t wait to try it! Looks so delish!! Thanks so much Toni! I hope you like it. 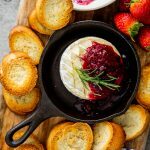 Cranberry and brie together is one of my favorite things! Love the presentation! Could pie crust pastry be used instead of cutting a circle from a pastry sheet? They come 2 in a package here in the U.S. I haven’t tried it with regular pie crust but I’m sure it will be fine. Alida, this is absolutely brilliant! So festive and so delicious! I love this idea! Really gorgeous! Thanks so much, it’s a festive showstopper! 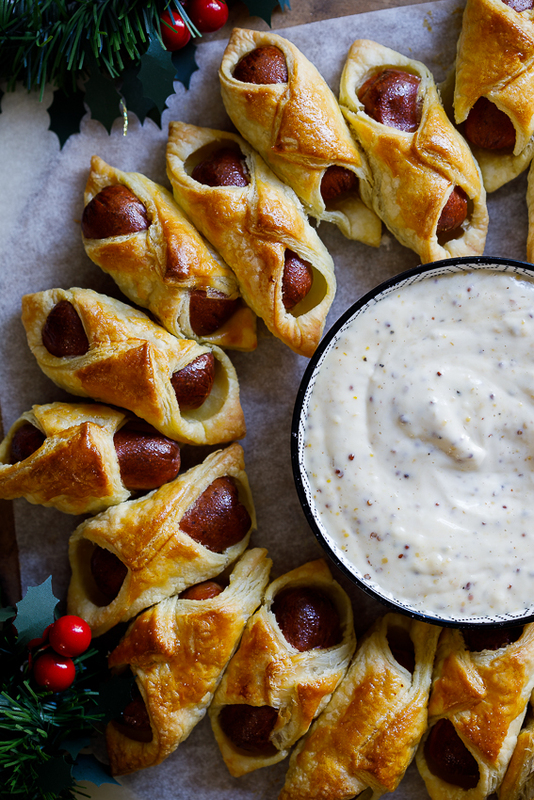 Such a fabulous appetizer for the holidays! It’s sure to be a big hit! Can I make this and then freeze it for Christmas and then rewarm it up? I don’t think the Brie will freeze well but you could make it the previous day and keep it covered in the fridge until you are ready to bake? I made this for a party over the weekend and it was AMAZING!!!! Super big hit and incredibly delicious!! Oh yay! I’m so glad to hear that! It looks delicious. I will prepare it for this Xmas. Do you leave the rind on the brie or take it off? I left it on but you could definitely take it off if you preferred. Would pecans or walnuts work? Yup, either would be perfect. I just made this for my friendsgiving this past weekend, in the US. 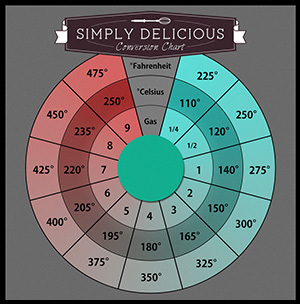 For other US people, please use google for any conversions you need, it’s 400F and about 12.7 ounces of Brie or about 3/4 of a typical full circle of Brie you would buy. I also used prepared frozen puff pastry that was in a square and just cut off the corners to make it circle-ish. Since you fold up the edges it’s forgiving on appearance, but for the inner circle I used the top of a ziploc container to imprint and it worked wonderfully. Overall, it looked great and tasted great, this is a keeper for future events. I should mention I made my own cranberry/apple sauce from fresh ingredients. I need to cook this in advance to take to a party, but I don’t want to burden my hostess. It’s seems like something that needs to beserved warm though -yes? Can you recommend an easy way to heat it up? Would hanging out at room temp for a little bit work? It may not work for this event…. Room temp would be fine. It’s lovely when warm but it’s just as good at room temp. Yes, all my recipes are in Centigrade/Celsius as is stated in the recipe section. Hi! This looks amazing! If I make it ahead of time, should I put the egg wash and salt on when I prepare it, or right before I bake it? Yes, I would egg wash it just before baking. What kind of cranberry did you use? This looks so insanely good. This is on the list for next week as I am hosting Thanksgiving. My hubby will be gushing over this. 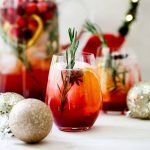 This sounds yummy…I made cranberry pepper jam recently and was just thinking it would be fun to try using some with this recipe. Has anyone made this substituting cranberry pepper jelly for cranberry sauce? I think it would be amazing. 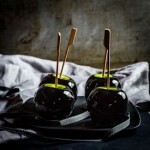 What herb did you use for the garnish?? I get a bit stuck on details.. can you help with approximate size of full circle and inner circle? The full circle is probably 20-30 cm in diameter and the inner circle around 10cm. My puff pastry came frozen in a roll. I have to thaw the whole package to get the individual sheets. However one sheet looks way to thin ? Would you suggest I used a couple of sheets to get it thick enough ? If so how many ??? Just realized I bought phyllo instead of puff. Going to go out and try to find puff. Would it still work with phyllo though as the package now thawed ?????? Hey, we USA folk don’t speak metric, lol! Can you give measurements in inches instead? Even if guesstimated . . . And thanks for your mercy . . .
I’m a Saffa living in the Netherlands and I would love to make this wreath for Christmas, however, I’ve hit a snag. Finding a roll of puff pastry here in NL is very difficult, and I have only been able to find square pieces of pastry roughly 12x12cm. Can I still use these sheets and how would you recommend folding them? Individual portions sound great, but I would like to do it correctly then. Secondly, is cranberry compote a good substitute for cranberry sauce because that’s all I can find. you could try to do mini wreaths? It’s a bit tricky since the pastry you’re using is already so small. Otherwise, if you’re not too bothered about the wreath shape and you just want the flavours, I suggest placing a little of all the ingredients in the center of each square of pastry and just folding the corners in to create a Danish pastry of sorts. This finally hit my feed! If you have access to plain cranberries, it’s easy to make your own sauce. A flavor tip – I use orange juice in place of water, and toss in a cinnamon stick. I never have leftovers! can this be made ahead and cooked later ? Yup, just cover it with cling and place in the fridge. Another posibility, if it’s available in Netherlands, would be croissant dough, pre-packaged in round cardboard cannisters in the refrigerated section. In the USA, this product is used extensively to make various stuffed wreaths. It won’t have the exact same light flakiness of the puff pastry, but I believe the results would be satisfactory . . .
Is there a particular brand of cranberry sauce used? The one in the video looks much thinner than the canned one I typically use. Or do you heat it up to melt it a bit? Is the temp correct? !….200 degrees doesn’t sound right??!!…. I live in Canada…200 would only be a warming oven! Yep, it’s 200 degrees Celsius. hello! 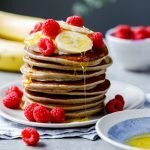 this looks amazing….do you think it would work with gluten free puff pastry? I’ve never worked with gluten free puff before but I don’t see why it wouldn’t work. Yum! Love brie and cranberry together! What a beautiful centerpiece for a holiday party too! Thanks so much. Cranberry and Brie are just a match made in heaven aren’t they? I just adore this wreath! What a perfectly festive (and delicious!) appetizer for the holiday season! Thanks so much Laura. 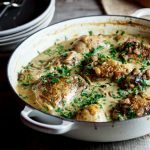 It’s one of my favourite recipes I’ve done this year. this needs to happen for my Christmas Eve gathering. 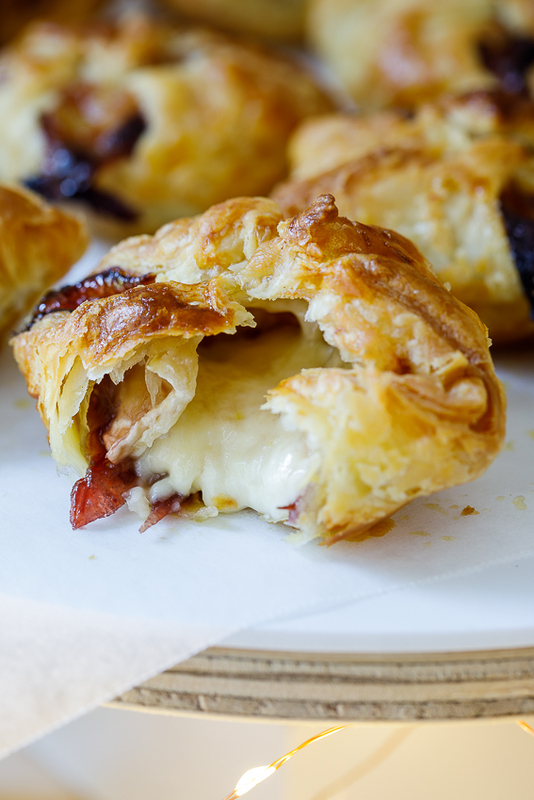 Puff, cheese and cranberries…you’re speaking my language. I know just how you’re feeling looking at that to-do list. The mad scramble before the trip is nuts. Have the best time! Pertty and easy – what’s not to like? Will be ideal for my vegetarians at Christmas.